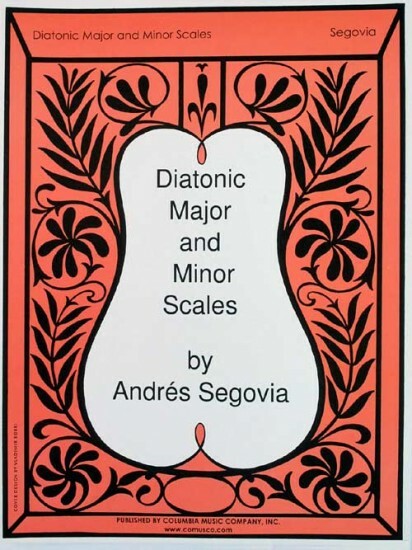 A collection of Diatonic Major and Minor Scales with fingerings and practice recommendations by Andres Segovia. "The student who wishes to acquire a firm technique on the guitar should not neglect the patient study of scales. If he practices them two hours a day, he will correct faulty hand positions, gradually increase the strength of the fingers, and prepare the joints for later speed studies. Thanks to the independence and elasticity which the fingers develop through the study of scales, the student will soon acquire a quality which is very difficult to gain later: physical beauty of sound. I say physical, because sonority and its infinite shadings are not the result of stubborn will power but spring from the innate excellence of the spirit." Great inventory, friendly service, reliable shipping. These are fundamentals that offer a continuous and overlapping series of teaching points, from the kinesthetic feedback of fretting notes up the neck, to right hand technique, tone production and even basic time keeping, whatever I'm working on, these exercises give me an opportunity to improve.